It’s technically not a new spellchecker but just the old LTS Spellchecker re-packaged. It works in Microsoft Office 2013 and checks about 200,000 words (though there’s a way of extending that, see below). You should be seeing the red lines now. If this is driving you up the spout, just switch it off, finish writing and then mark the text as Gaelic once and check for errors. As I mentioned, this is just the old LTS newly packaged. Not a lot of fixing or indeed extending happend and even though they were offered the big list from the Dearbhair Beag, they turned it down. But there is a way. 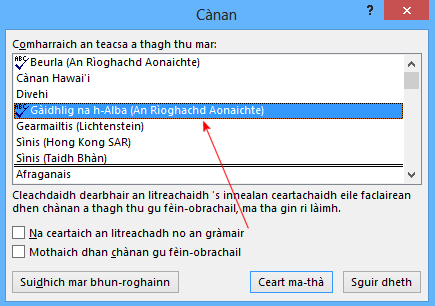 Although it’s not possible to fix the gaps and errors that it inherited with the LTS file, since there now is a Gaelic lexicon file, you can extend that with a custom dictionary. Now you may not need that if you’re looking at primary school level stuff but for a dissertation or an author, having the extra capability might well come in handy. Make sure you’re in \UProof and not \Proof, that got me several times. That pushes the wordcount from some 200,000 to just over 1.1 million words. Happy spellchecking! Mòran taing son an fhiosrachaidh sin. 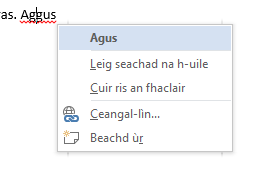 Tha an làrach-lìn seo uabhasach feumail, mar a bhrosnaicheas e diofair dhòighean Gàidhlig a chleachadh ann suidheachaidhean làitheil, leis an teicneòlas. 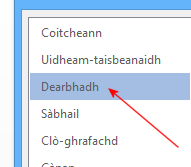 Tha mi air an rud seo fheuchainn leis an dreach de Word agam – Word 2010 – ach cha do shoirbhich mi idir. Tha mi a’ leughadh gu bheil an dearbhair seo airson Office 2013. A bheil dòigh ann a luchdachdh le dreachan eile nam prògram? ‘S e do bheatha. Air Office 2010 is feadhainn nas sine, b’ urrainn dhut an rud a rinn LTS fheuchainn ach tha sin car cugallach, chan obraich e mar bu chòir an-còmhnaidh. A cheud turas a fheuch mi an comas seo a chleachdach, cha robh mi soirbheachail. 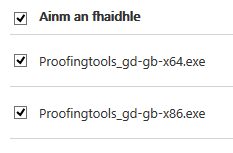 Tha Office 2016 agam, agus tha mi a’ smaoineachach gur e sin as corrach. A bheil dochas ann? 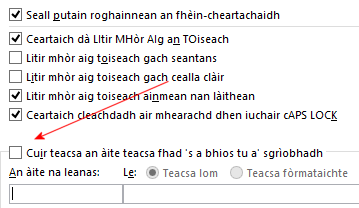 Dè am pìos nach eil ag obair?